An upper-level political theory seminar, “Citizens, Judges, Juries: Who Decides in Democracy,” taught by Sonali Chakravarti, assistant professor of government, visited the Middlesex County Courthouse on April 22 to see proceedings and speak with the clerk and two judges. Students had the opportunity to talk about the relationship between the law and racial injustice, discretion in sentencing, jury nullification, and the current populist movement to change the way family law courts adjudicate custody cases. This is the first semester that this course is offered and the first time Professor Chakravarti took students to the courthouse. 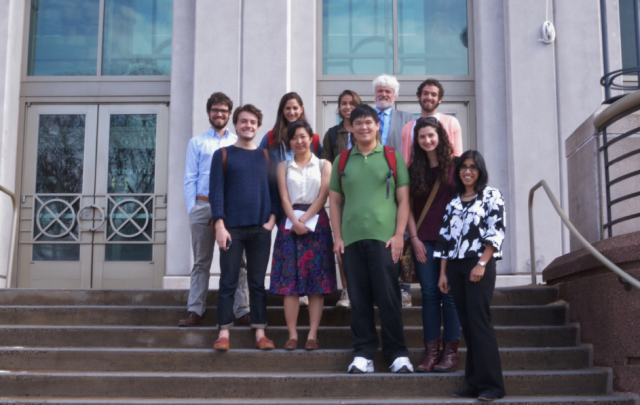 Pictured in the photo are, from left, Sam Furnival ’15, Ben Romero ’16, Ruby Lang ’17, Yiyang Wang ’15, Hannah Goodman ’16, Aiden King ’14, Deputy Chief Clerk Jonathan Field, Ari Ebstein ’16, and Hadas Werman ’14 with Professor Chakravarti to the far right.